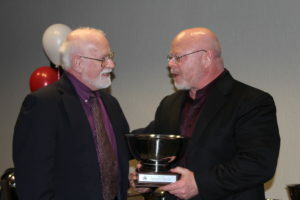 Paul Anderson, Regional Executive of the Washinton DC Region of the SCCA, presents Ted Cahall with the Regional Executive Award for the development of the marrspoints.com web application. This month I was awarded the Washington DC Region – SCCA Regional Executive’s Award by Paul Anderson for the development and management of the marrspoints.com web application. Building marrspoints was such a great way to join my two hobbies: auto racing and software development. It really gave me something useful to work on through which other racers could also benefit. What an honor to be recognized. But these things do not happen in isolation. I could not have done it without the help and guidance of Lin Toland. Lin was there providing the feature requests and feedback on the design and functionality. He also did a lot of unpaid QA for my early roll-out. You are a first class leader Lin – thank you. Lin still helps navigate the WDCR SCCA region for me and helps me look at new feature requests including Bracket Racing with Chuck Edmondson. I would also like to thank Mike Collins of Meathead Racing for getting me involved in racing with the SCCA. It’s like putting cash in a coffee can and lighting it on fire!